We made lamingtons. We made a lot of mess. 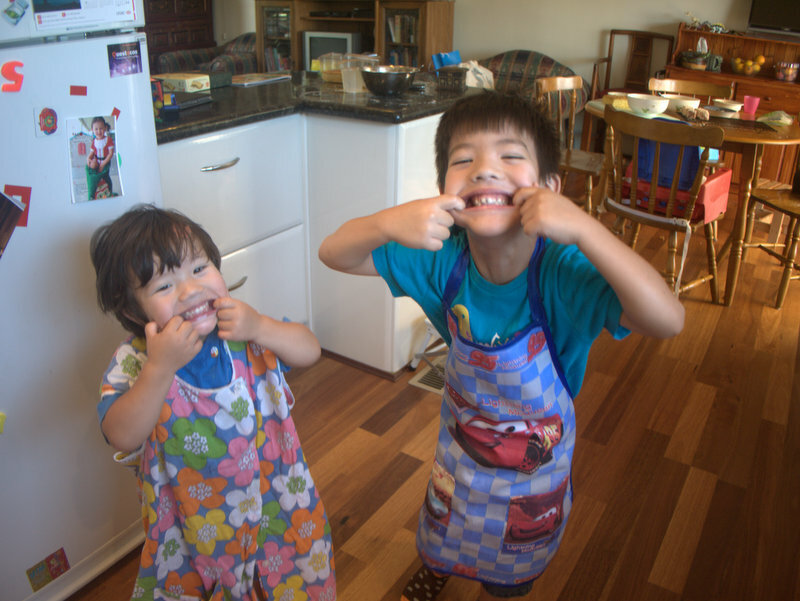 We mostly had fun … until the boys got bored. A good friend came over this morning, we sat and did some craft together on the balcony, and then baked. We, sort of. 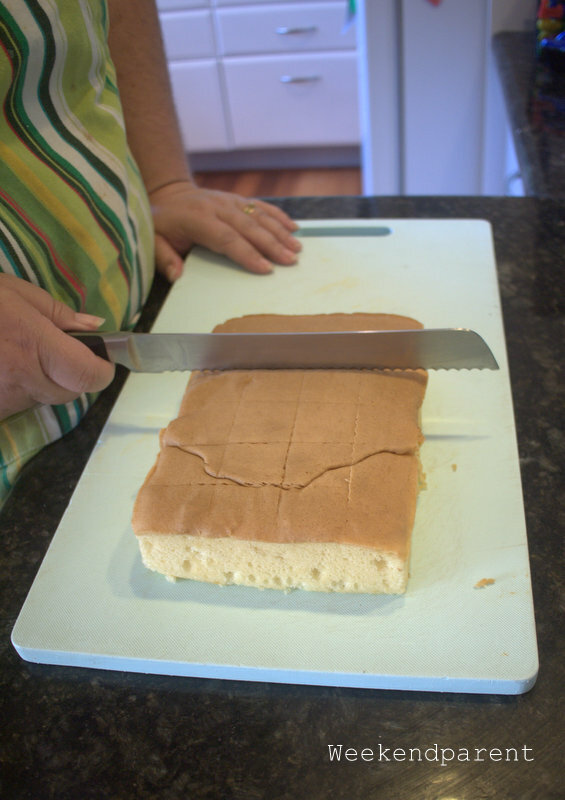 Given the hot, humid, stormy weather I cheated and bought two slabs of supermarket made sponge, which we used to make lamingtons. I am glad I did as Little A did not settle until nearly 11.00pm last night in the hot weather so I would have been tired and cranky if I had attempted baking. I am slowly learning not to try to be supermum. 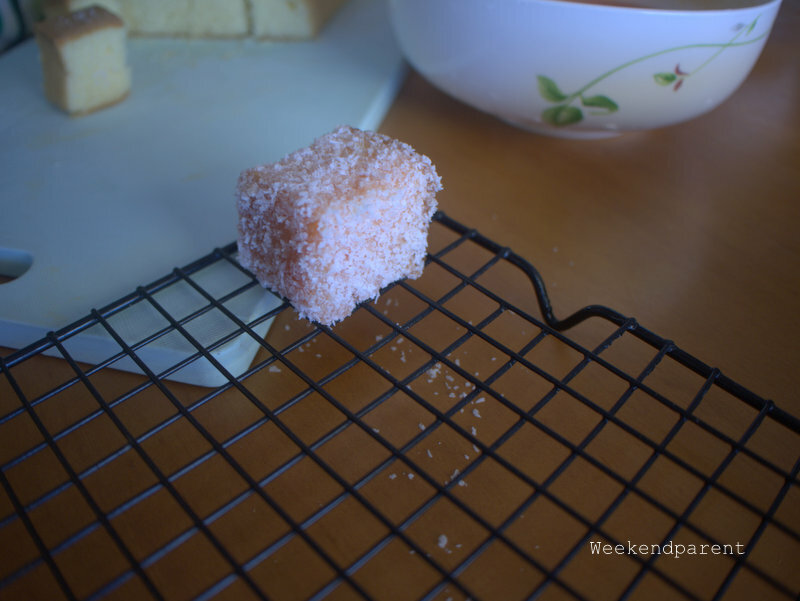 So we made lamingtons, without having to even turn on the oven. My friend was amazed at how simple they are to make: they are a bit messy, but that is half the fun. 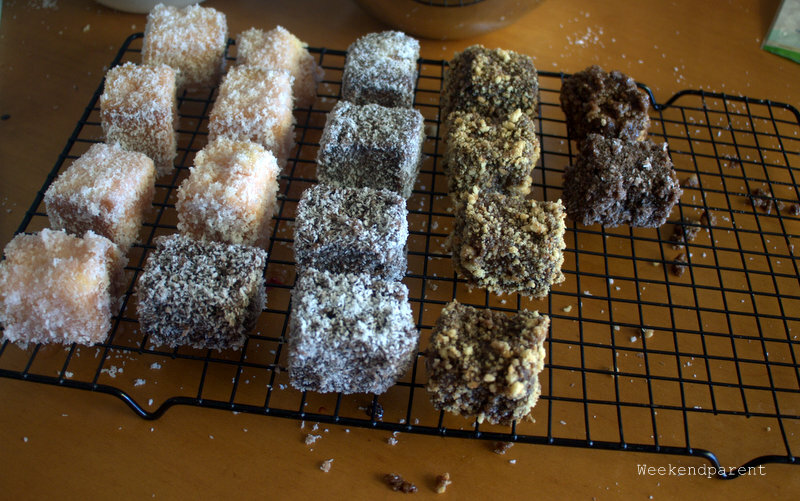 I ran out of dessicated coconut halfway through, so we improvised with sprinkles and crushed peanut butter cookies (OMG, chocolate lamingtons with peanut butter cookie crumbs – to die for). 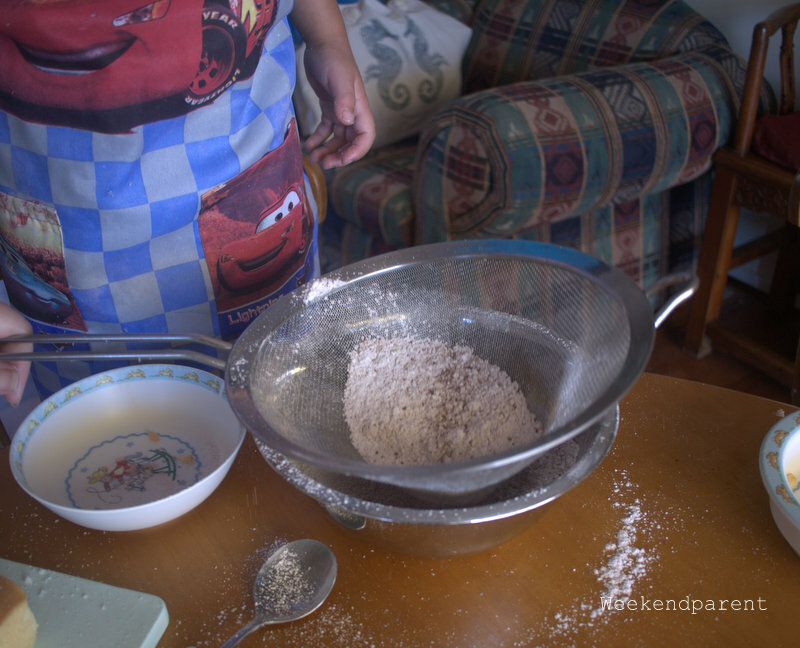 Lamingons are a great thing to make for Australia Day. Its origin as ‘Australian’ is contested, with New Zealanders also laying claim to lamingtons (as with the pavlova). Never matter – they are widely eaten in Australia, especially on Australia Day. And they are a fun thing to make with kids. Make the liquid dipping mixtures. For the strawberry mixture, pour the boiling water over the jelly crystals and butter. Allow the butter to melt, and then stir in the icing sugar. (Note: I added a few drops of red food colouring as I thought the colour was too light). For the chocolate mixture, sift the cocoa powder and icing sugar together. Heat the milk and butter together until hot (not boiling). 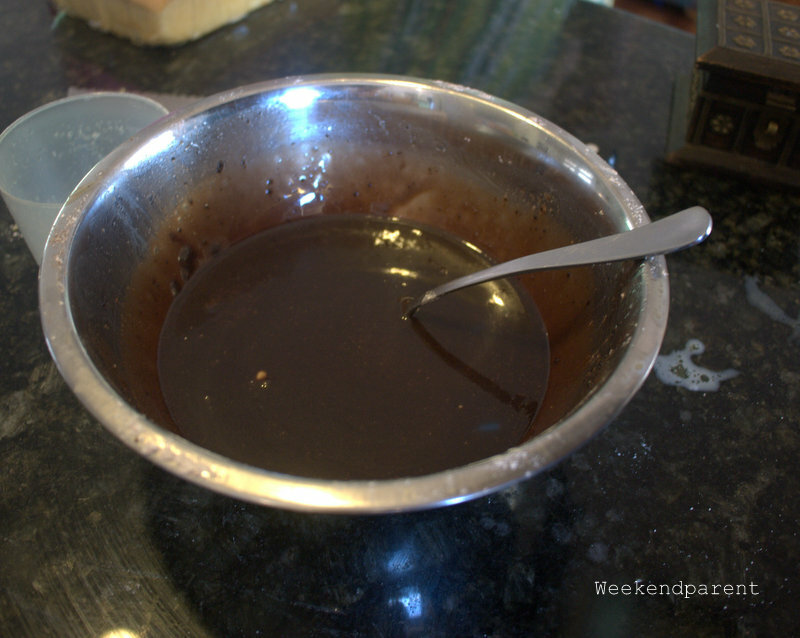 Allow the butter to melt, then mix into the icing sugar mixture and beat until glossy. To assemble, dip a piece of the sponge cake into one of the strawberry or chocolate mixtures, then roll into the coconut mixture. Do this carefully as the cake is brittle, and don’t leave the cake in the liquid too long or else it will puff up like a sponge (presumably why it is called sponge cake). Allow to set slightly in the fridge, then enjoy with a cup of tea and good company. 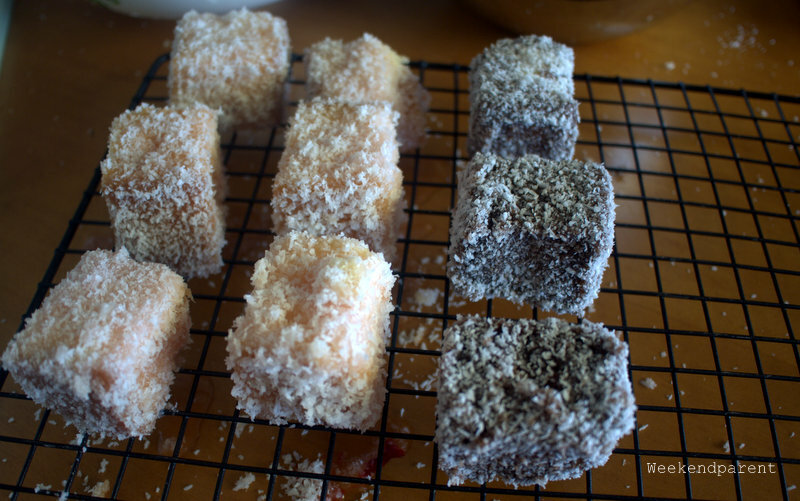 For frugalistas: as lamingtons are best made with day-old cake, you could see if your local bakery has any sponge cakes that are no longer fresh. 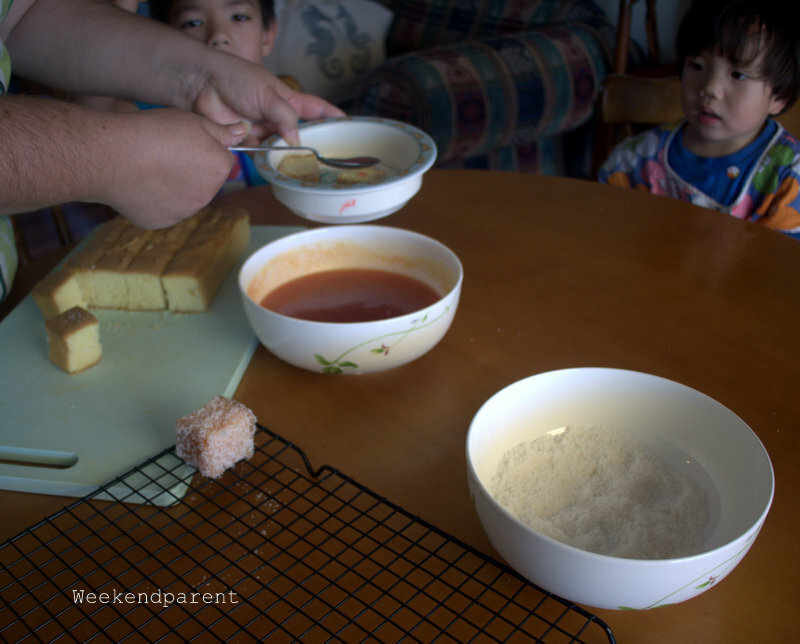 Sponge cake freezes well and you can put aside until ready to use. I substituted hundreds and thousands (worked less well), and peanut butter cookie crumbs (fabulous). What fun! They look delicious. I worked on a school lamington drive one time in the 90s… and the coordinators used that bottled chocolate sauce that goes into milkshakes! I was stunned, but the lamingtons were delicious! Oh my, chocolate sauce! I can imagine that working really well, though, as the texture would be just right. I fully intended to make sponge cake, and even got a CWA recipe out. But then I thought to myself: on such a hot and muggy night with a child not sleeping, what am I doing to myself? I so rarely take cooking shortcuts, but sometimes they can save a lot of stress. 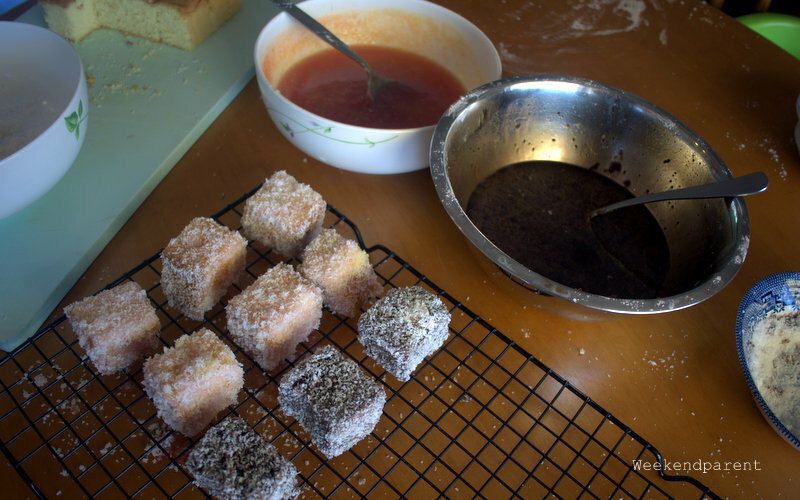 I made lamingtons on Australia day as well! It was my first time and was surprised at how easy they were to make! Another tip is to freeze the cake for a couple of hours before icing it! Oh, must have a lamington on Australia Day! Glad you got one.